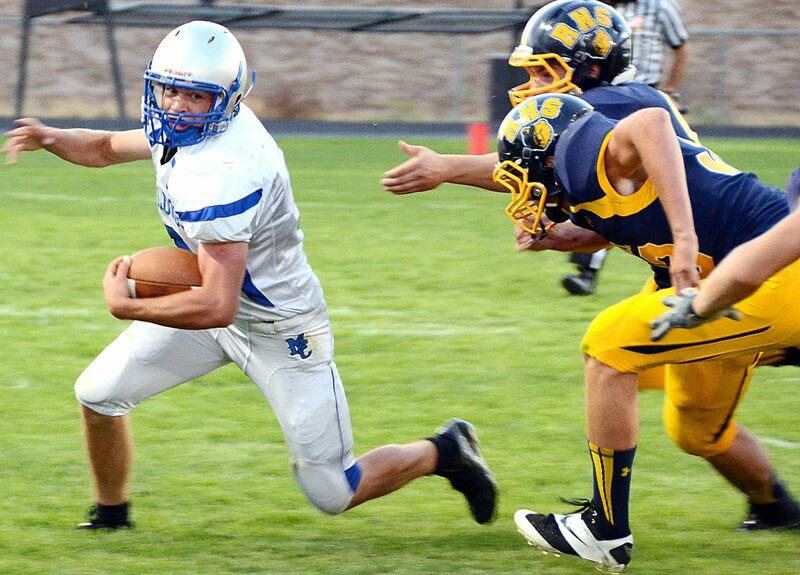 Moffat County quarterback Joe Camilletti avoids Rifle defenders while scrambling at Bears Stadium last fall. Camilletti found himself in and out of a starting job on the football and basketball teams this year but managed to stay competitive despite the uncertainty. Faced with changing circumstances all year, Joe Camilletti just kept competing, and that’s why he’s the Moffat County High School male athlete of the year. Camilletti, a junior, found himself in and out of the starting quarterback job during football season, then in and out of the starting lineup in basketball season. Instead of worrying about it, he played. None did their part better than Camilletti. During a difficult football season, he grew into the quarterback role, accounting for seven total touchdowns in Moffat County’s two wins, while the team’s offense doubled its scoring average in the second half of the season. In basketball, whether he was in the starting lineup or coming off the bench, Camilletti’s quick hands made him a pain for opposing guards at the head of Moffat County’s press. With 11.6 points and 2.3 steals per game, he was a spark in the Bulldogs’ fast-paced style. Camilletti’s competitive nature comes from a family rivalry. His half-brother Shane, more than double his age, has been a consistent source of motivation. “I always compete against him, and he always beats me, but it’s made me better,” he said. In 2014, the junior tried his hand at track and field for the first time in high school, hoping to get faster for football and basketball. Track wasn’t his top sport, but Camilletti leapt over 18 feet in the long jump and ran on the boys 4×100-meter relay team, which qualified to the state meet. Track gave him the opportunity to test himself against his own abilities.